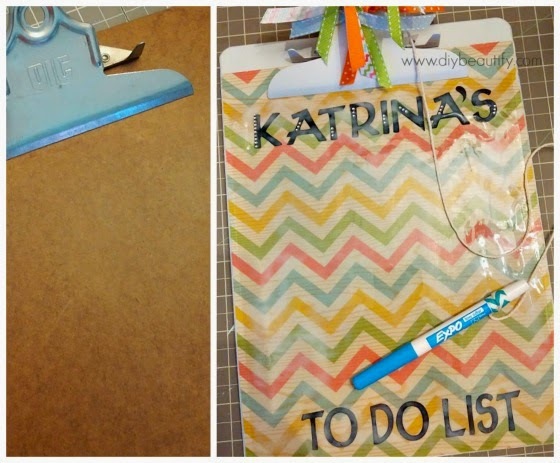 Clipboard for Teen Girl and a Cricut Giveaway! I absolutely love my Cricut Personal Cutter and use it several times a month. One of the ways I use it is to make customized gifts. A personal gift is so much better than something generic off the shelf, isn't it? With my Cricut, personalized gifts are really just a cut away! My niece Katrina was visiting from Ontario, Canada and she was going to be turning 13 while at our home. 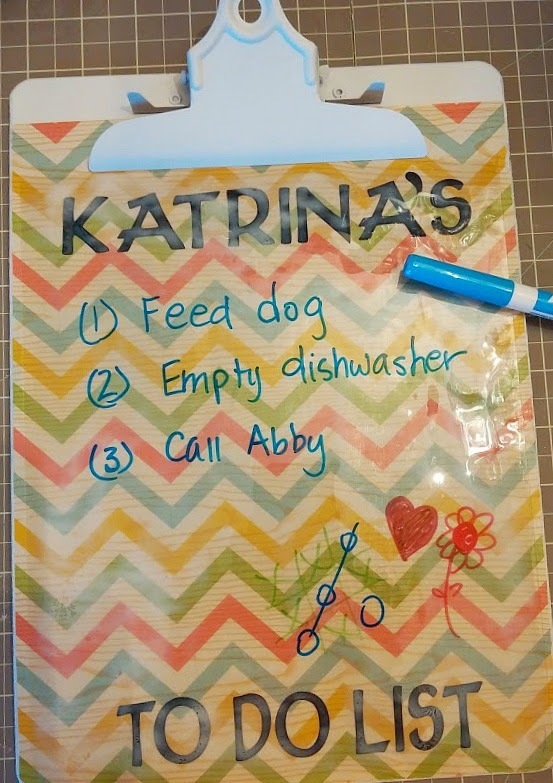 I decided to make a cute, personalized TO DO Clipboard for her. This was a bit of an experiment because I wanted to have cute paper, but make the clipboard like a dry erase board. My 'secret product''? An old ink jet transparency. I have a box of these from my old job when they were switching over to a laser printer. My supplies: a clipboard, white spray paint, cute paper (mine is wrapping paper, but any fun patterned paper will do), a transparency sheet, Mod Podge and a Cricut (you could use black stickers if you don't have a Cricut). I spray painted the clipboard handle and edges white. Once dry, I Mod-Podged a piece of cute chevron paper on top. Here's a simple trick to getting your paper the PERFECT size. After it's glued down and dry, use a piece of sandpaper and sand the edges! It gives the perfect, custom fit! Using my handy-dandy Cricut machine and black vinyl, I cut out the words I wanted and adhered them to the paper. I cut my transparency sheet to fit over the patterned paper and then use a very thin layer of Mod Podge to glue it down. I love this because all the 'cute stuff' is protected under the vinyl film. Now Katrina can use dry erase markers to write what she wants...and then easily erase it! I finished this fun project off by adding a bit of bling with tiny gem stickers that I attached to the letters of her name and tying a variety of ribbons to the clip as well as a dry erase pen. This project would have been much more difficult to pull off without my Cricut machine. The problem with stickers is that you often don't have enough of the letter (usually a vowel) that you need and you must purchase additional packages. The Cricut allows you to only cut what you decide to cut, and in the size you want it to be!! Right now at Cricut.com, you can get Free Shipping on Cricut Orders of $35+ with code FREESHIP35 when you check out. And right here, right now, you can enter to win a brand new Cricut Explore! The new Explore will cut paper, vinyl, vellum, cardstock, chipboard, aluminum, leather, felt, acetate, and even fabric!!! Just click on the Rafflecopter link below to get started!! Enter to Win a Free Cricut Explore!